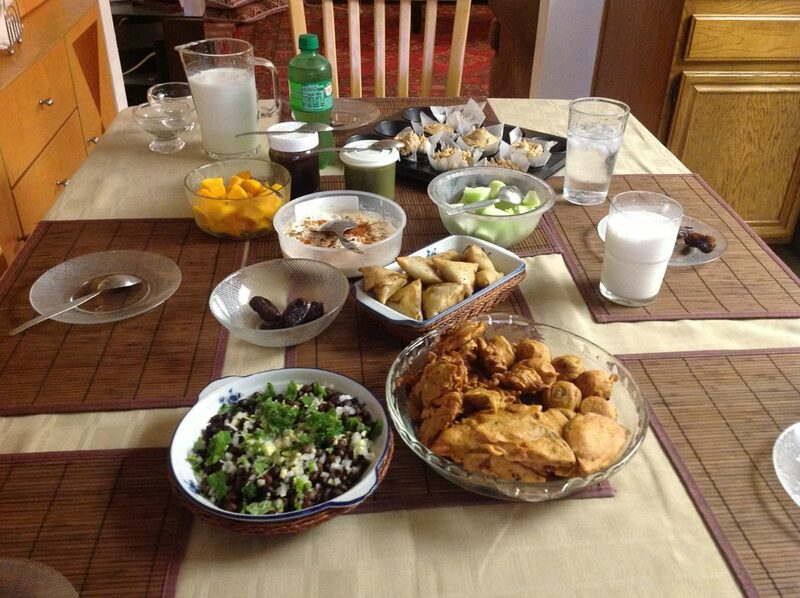 Iftari at the Shaikh house, its to early to take pictures of Sahoor. I usually am not of sound mind to take an appropriate picture at the time so I share our table scape when we break the fast. I recently was interviewed by Mona Shadia for her column “Unveiled: A Muslim Girl in O.C.” about Ramadan and Sahoor (the really early morning meal to start off the fasting day). She’s a is a reporter for Times Community News. An Egyptian American, she was born and raised in Cairo and now lives in Orange County. Her column includes various questions and issues facing Muslims in America. Follow her on Twitter @MonaShadia. Below is an excerpt from our conversation for her piece titled “The benefits of Ramadan are truly endless“, go support her! Affad Shaikh [thats me], a Muslim American of Pakistani descent whom I know from the Council on American-Islamic Relations [I did that, and loved every minute of it], left his Newport Beach [love living there] apartment for the month to spend Ramadan with his family [SUPER excited about being able to do this, its like I am a fat kid in a candy store all alone type of excitement]. Affad, 29, recently quit his job [I hate not having an income] and is attending law school [which I suggest people not do]. He’s out for the summer [SWEEeeeeet! ], which presented the perfect opportunity to spend Ramadan with his parents and younger brother [on twitter at @shaikhster] and sister [on twitter @ashaikh3] in Palmdale for the first time in a few years. The family’s alarm clocks go off right at 3:30 a.m. [more like my mom starts the stove and i realize the scrumptious goodness I’m about to miss out on if I don’t wake up], the lights go on and all members of his household gather in the kitchen for fried or boiled eggs. Mom prepares Paratha [yummmmmmy! Give me some of ’em right now! ], which is like Pakistani tortilla that Affad and his brother like to eat with honey and dad prefers with banana. Affad makes himself a protein shake. When the food is ready, everyone sits together to eat, talk and laugh. Affad said they talk about the news, about their plans for the day. Because their dad leaves to work at 5:30 a.m. [God bless his soul and let us kids be even a tiny bit disciplined like him. Ameen! ], it’s a great chance to spend time and talk with him in the morning.